Darjeeling: Darjeeling police are running the extra mile to foster peace and harmony by lining up a half-marathon with international athletes on January 12. The marathon, being organised in association with The Telegraph and the Gorkhaland Territorial Administration (GTA), is part of a plan to improve police-public ties through a number of initiatives. 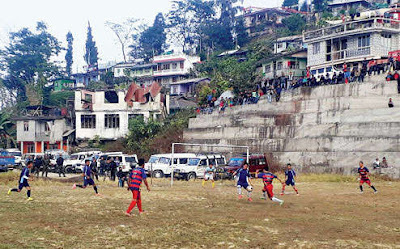 The police are currently hosting football tournaments across the hills and, with more than Rs 6.5 lakh as prize money, the events are turning out to be major attractions. The 21km half-marathon is expected to be even bigger. "The half-marathon will be held on January 12, the 155th birth anniversary of Swami Vivekananda. International athlete Anju Bobby George will be the chief guest," said Akhilesh Chaturvedi, SP, Darjeeling. Anju made history when she won the bronze medal in long jump at the 2003 World Championship in Paris and became the first Indian athlete to win a medal at a word championship in athletics. "International athletes, especially from Kenya and Nigeria, will be participating at the event," said Chaturvedi. The run will start at 8.30 am from Sukhiapokhri and end at Chowrasta. In an effort to encourage local runners, the organisers have also decided to have a separate category solely for residents of Darjeeling and Kalimpong districts and another category for police personnel from West Bengal. While the winners in open category, both male and female, will be getting a prize money of Rs 1.5 lakh, the first and second runners up will be awarded Rs 75,000 and Rs 50,000 respectively. "For the winners, first and second runner ups in the Darjeeling hills category and police category, the amount will be Rs 25,000, Rs 15,000 and Rs 10,000 respectively," said Chaturvedi. Winners up to the 10th position will be getting prize money and the total prize money for the marathon will be around Rs 8 lakhs. In the past one month, police and the local administration has been hosting a number of events to send out a message that there is peace in the hills. The GTA recently organised a- five- day Teesta-Rangeet Tourism Festival across the hills. On New Year's Eve, Darjeeling police organised a musical show at Chowrasta. Apart from the marathon, the state government will also be organising Uttar Banga Utsav on January 12 and 13 at Chowrasta. "During the marathon day, we will also get well known Nepali artists to perform at Chowrasta," said Chaturvedi. Darjeeling police are running the extra mile to foster peace and harmony by lining up a half-marathon with international athletes on January 12.